square to the blade and have the grain of the splines running across the miter— not up and down. With my tablesaw jig, you can straighten irregular edges on rough stock or saw tapers for table legs and the like. Unlike most ripping jigs, mine is guided by the T-slot in the saw table, not the fence. I used a piece of -V^in. 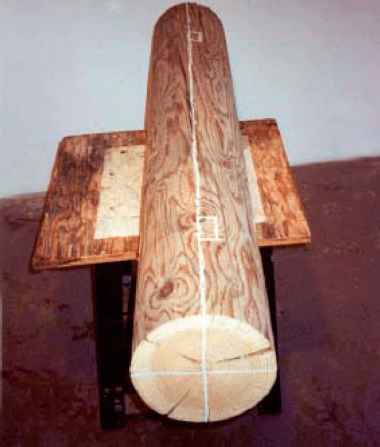 plywood, 1 ft. by 8 ft. long, and installed a track as shown. 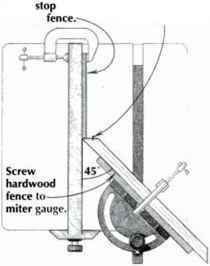 The lever clamps arc screwed to blocks that can be positioned anywhere along the track and secured with threaded knobs. I got the track and the hold-down kit from the Woodworkers' Store, (800) 279-4441. With only one vise I had difficulty supporting long boards when planing the edges. Rather than invest in a second vise I installed a pipe clamp as shown. When I don't need it, I unthread the handle and slide the pipe back under the bench. This idea is readily adapted to fit a solid-top bench. Slide block and up to work secure with knob. Solder brass nut to pipe. solder. (Solder won't stick to stainless steel). 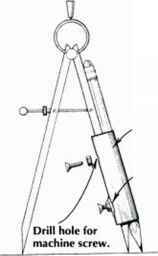 Then flatten the tube in a vice to form an oval of a size to accommodate both the pencil and a divider leg. Finding replacement dust bags for an older machine can be a costly nuisance. My solution is to buy bank change bags (used for coins) and modify them as shown in the sketch. I then attach the bag to the machine with wire tics or a hose clamp.